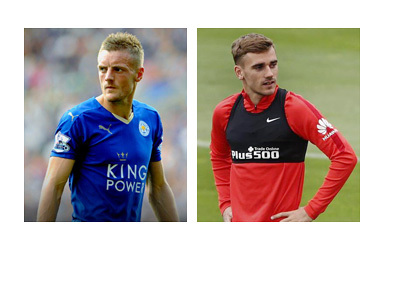 The 2015/16 season sensations, Antoine Griezmann and Jamie Vardy, extended their contracts with Atletico Madrid and Leicester City respectively. There was significant interest for the two players by the European elite, but both Griezmann and Vardy decided to keep a good thing going and stay loyal to their clubs. This development also shows the intent of Atletico Madrid and Leicester City when it comes to next season and future in general. Jamie Vardy had a £120k / week offer on the table from Arsenal after they triggered his £20m release clause. The England striker instead decided to extend with Leicester City for four additional years, receiving a smaller salary (£100 / week) and less commercial / advertising money. First team status and hero status with Leicester fans have probably been achieved as a result of this decision. Good times for a striker who arrived from Fleetwood Town for £1m four years ago. The 29 year-old Vardy, with his scoring ability, was hugely responsible for helping Leicester win their first English Premier League title. After keeping Vardy at the King Power Stadium maybe Leicester can find a way to hold onto their other two stars N'Golo Kante and Riyad Mahrez as well. One of the biggest targets in the upcoming summer transfer market, the French forward Antoine Griezmann, extended his contract with Atletico Madrid by one year, until June 30th, 2021. The 25 year-old Griezmann arrived from Real Sociedad two years ago and has been the Atletico Madrid's top scorer since. In his first season he banged in 25 goals and in his second 32. During this time Atletico won the La Liga title and were in the final of the UEFA Champions League. Atletico Madrid, as we wrote a few weeks ago, do not need to be a selling club any more. The new Spanish broadcasting deal is taking effect and it brings a lot more cash to the nation's third biggest club. Making it to the Champions League final twice in the last three seasons also helps with the financials. The weekly salary Griezmann is to receive from the club is yet to be revealed. Atletico Madrid are promising to try and retain key players from here on. Good stuff from Leicester and Atletico!